Note: The Canon EF 24mm f/1.4L USM Lens has been replaced by the Canon EF 24mm f/1.4L II USM Lens. The Canon EF 24mm f/1.4L USM Lens has been replaced by the Canon EF 24mm f/1.4L II USM Lens in Canon's lineup. The 24 L II features much better wide open image quality, less CA throughout the aperture range and weather sealing. The Canon EF 24mm f/1.4L USM Lens was introduced 1 year before its very slightly longer and narrower sibling, the Canon EF 35mm f/1.4L USM Lens. The Canon 24mm L has 77mm filter threads while the 35mm has 72mm threads. Otherwise, these two lenses are very similar. Their weights are similar - 19.4 oz (550g) for the 24 vs. 20.5 oz (580g) for the 35. The 24 measures 3.3" x 3.0" (83.5mm x 77.4mm) (DxL) vs. 3.1" x 3.4" (79.0mm x 86.0mm) for the 35. The resulting image quality is excellent from both lenses. The 24mm f/1.4L is solidly built with a professional grade feel (part of its Canon L Series Lens heritage). It is relatively compact and handles very nicely. Ring USM (Ultrasonic Motor) also provides for FTM (Full-Time Manual) focusing. The Canon EF 24mm f/1.4L USM Lens focuses quietly and quickly. Pictured above from left to right are the Canon EF 24mm f/2.8 Lens, Canon EF 24mm f/1.4L USM Lens, Canon EF 35mm f/1.4L USM Lens and the Canon 24-70mm f/2.8L USM Lens. The Canon EF 24mm f/1.4L USM Lens is soft wide open, increasing in sharpness until very sharp at f/2.8. Corners are somewhat soft until stopped down some - becoming very sharp for a 24mm lens. Light fall-off is very noticeable at f/1.4, and, as usual, improves as the lens was stopped down. The 24 L exhibits noticeable amounts of CA. Compared its sibling, the 35mm f/1.4 L, the 24mm f/1.4L is a bit less sharp at comparable apertures until stopped down to f/5.6 or so. The 24mm L was slightly sharper in the corners. Colors again were similar. Distortion on the 24mm f/1.4L is low. Proneness to flare is relatively low - starting with very little wide open and increasing to noticeable at narrow apertures. The quality of the 24mm f/1.4 L's background blur is nice. Creating a diffusely blurred background is not easy with a 24mm lens - a wide f/1.4 aperture is very helpful in this regard. Even at 24mm, depth of field for a close subject is shallow at f/1.4. You must get the focus exactly right for sharp results. This wide aperture makes the Canon EF 24mm f/1.4L USM Lens suitable for low-light and low-light action photography. Do you want to catch that indoor shot without a flash? This lens can do it better than most other non-IS lens. The 24mm focal length yields a strong perspective to relatively close subjects - a dramatic separation of subject from the background by making the background appear farther away. This creates a strong sense of presence when used close to a subject. This fact makes a 24mm the wrong choice for most close-up portraits. Noses will look like Pinocchio's during a lie. When used for portraits at a distance such as environmental portraits, group photos, stage photography ... the 24mm f/1.4L works well. The included EW-83DII lens hood on my Canon EF 24mm f/1.4L USM Lens fits very tightly - it is not fun to install or remove this hood. While I hoped this was an anomaly with my particular lens, I have had multiple people email to say their 24 L also has an unresonably tight lens hood. My second copy of this lens also had a very tight lens hood, so I conclude that lens hood tightness is a "feature" of this lens. I suspect the hood will loosen up some with use - or better yet - add a little body oil to the threads. Your body oil (from your forehead, side of nose ...) that is. A soft, leather-like Canon Lens Case LP1214 is included in the box. Though it has a padded bottom, I consider it more of a pouch. While the 24 L does not have a large native maximum magnification (.16x) at .82' (.25m), it can be used with the 12mm Extension Tube to achieve a very nice .66x magnification. Of course, a 24mm perspective at this magnification will be unique. Watch the background when using this lens as 24mm will allow lots of it into the shot. 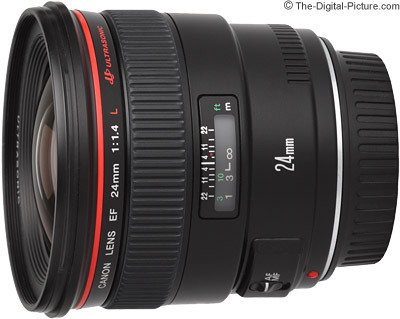 The bottom line is that the Canon EF 24mm f/1.4L USM Lens is an excellent lens. But, the 24 L II is even better. Read the full Canon EF 24mm f/1.4L II USM Lens Review for a direct comparison.